I’ll be accompanying some of the students from my school on a history trip to Ypres and a few other World War 1 battlefields in a few weeks’ time. 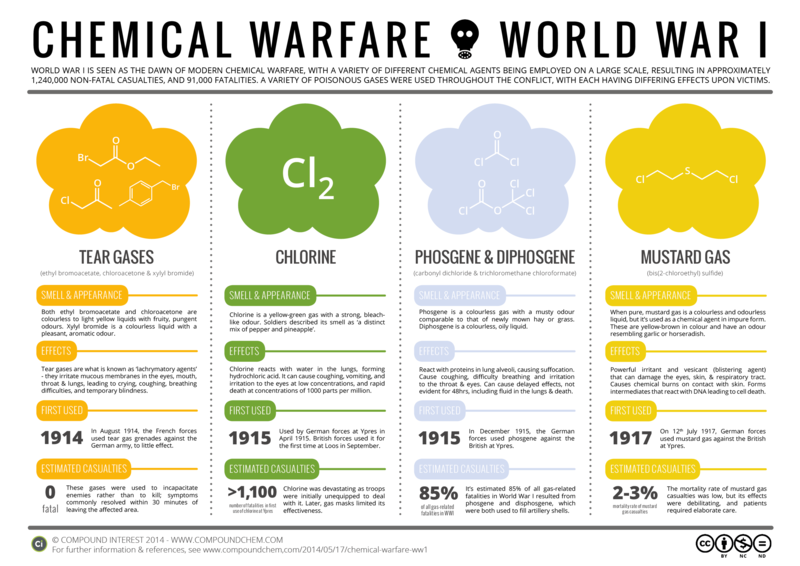 Obviously, they’d much rather be learning chemistry, so I’ve been reading up on the different chemical agents used during World War 1, and this graphic is a byproduct of that. As it turns out, several of them were used for the first time at Ypres, so it’ll even be topical! 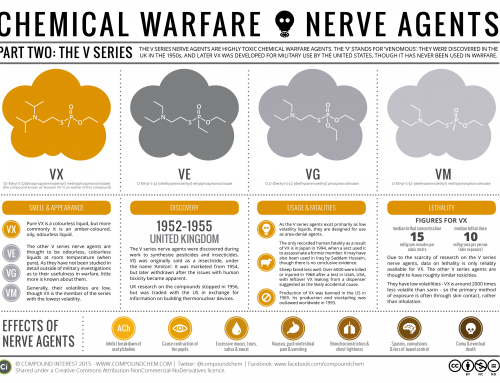 A range of different chemicals were used as weapons throughout the conflict. The French were actually the first to utilise them in conflict, when they attempted to use tear gas against the German army in August 1914. The precise agent used seems to be uncertain, with both xylyl bromide and ethyl bromoacetate being mentioned; both are colourless liquids, with the former having an odour described as ‘pleasant and aromatic’, and the latter being described as ‘fruity and pungent’. These tear gases weren’t designed to kill; rather, to incapacitate the enemy and render them unable to defend their positions. They are all lachrymatory agents – that is, they cause crying, due to irritation of the eyes. They also irritate the mouth, throat and lungs, leading to breathing difficulties. Exposure to larger concentrations can lead to temporary blindness, but symptoms commonly resolved within 30 minutes of leaving affected areas. In practice, the use of tear gas on the battlefield wasn’t extraordinarily effective. However, it opened the door to the use of more harmful gases. The first of these was chlorine, first used on a large scale by the German forces at Ypres in April 1915. Chlorine is a diatomic gas, about two and a half times denser than air, with a pale green colour and a strong, bleach-like odour which soldier described as a ‘mix of pineapple and pepper’. It reacts with water in the lungs to form hydrochloric acid, which can quickly lead to death. At lower concentrations, it can cause coughing, vomiting, and irritation to the eyes. In its first uses, chlorine was deadly. Against soldiers not yet equipped with gas masks, it wreaked havoc, and it’s estimated over 1,100* were killed in the first large scale attack at Ypres. The German forces weren’t prepared for just how effective it would prove, and their delay in pressing into the gap formed in enemy lines actually meant they gained very little ground initially. However, chlorine’s effectiveness was short-lived. Its obvious appearance, and strong odour, made it easy to spot, and the fact that chlorine is water-soluble meant that even soldiers without gas masks could minimise its effectiveness by placing water-soaked rags over their mouth and nose. Additionally, the initial method of its release posed problems, as the British learnt to their detriment when they attempted to use chlorine at Loos in France. The released gas changed direction as the wind changed, engulfing the British lines instead of those of the enemy, and leading to a large number of self-inflicted casualties. Phosgene was the next major agent employed, again used first at Ypres by the Germans in December 1915 (although some sources state the French were the first to employ it). Phosgene is a colourless gas, with an odour likened to that of ‘musty hay’. For this odour to be detectable, the concentration of phosgene actually had to be at 0.4 parts per million, several times the concentration at which harmful health effects could be expected. It is highly toxic, due to its ability to react with proteins in the alveoli of the lungs and disrupt the blood-air barrier, leading to suffocation. Phosgene was much more effective and deadly than chlorine, though one drawback was that the symptoms could sometimes take up to 48 hours to manifest. Its immediate effects are coughing, and irritation to the eyes and respiratory tract. Subsequently, it can cause the build-up of fluid in the lungs, leading to death. It’s estimated that as many as 85% of the 91,000 deaths attributed to gas in World War 1 were a result of phosgene or the similar agent diphosgene. It’s hard to put a precise number on, since it was commonly used in combination with chlorine gas, along with the related chemical diphosgene. Combinations of gases became more common as the war went on. For example, chloropicrin was often used for its irritant effects, and its ability to bypass gas masks, causing sneezing fits which made soldiers remove their masks, exposing them to poison gases. 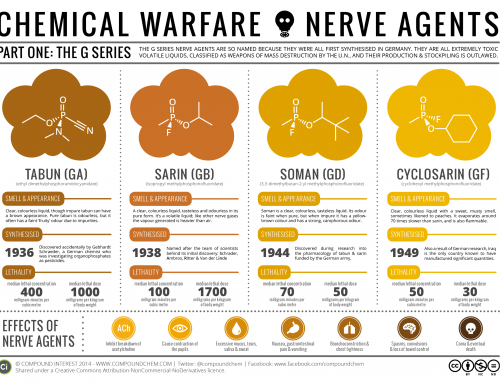 Along with chlorine, the most commonly known poison gas used in the conflict is mustard gas. Sulfur mustards are actually a class containing several different compounds; in their pure forms, they are colourless liquids, but in warfare impure forms are used, with a yellow-brown colour and odour akin to garlic or horseradish. Mustard gas is an irritant, and also a strong vesicant (blister-forming agent). It causes chemical burns on contact with the skin, leading to large blisters with yellow fluid. Initially, exposure is symptomless, and by the time skin irritation begins, it is to late to take preventative measures. The effectiveness of mustard gas was due to its debilitating effects. Its mortality rate was only around 2-3% of casualties, but those who suffered chemical burns and respiratory problems due to exposure were unable to return to the front, and required extensive care for their recovery. Those who did recover were at higher risk of developing cancers during later life due to the chemical’s carcinogenic properties. Overall, though the psychological factor of poison gas was formidable, it accounted for less than 1% of the total deaths in World War 1. Though their use was feared in World War 2, and they were employed in some cases, they were never employed on as large and as frequent a scale as seen in World War 1. Use of poison gas as a weapon was later prohibited by the Geneva Protocol in 1925, which most countries involved in the First World War signed up to. However, the chemicals used still have their uses – for example, phosgene is an important industrial reagent, used in the synthesis of pharmaceuticals and other important organic compounds. *Note: the article and graphic originally stated that the first use of chlorine gas at Ypres resulted in approximately 5000 deaths. However, recent recalculations suggest by the Flanders Fields Museum suggest that 1,100 is a more realistic estimate, albeit perhaps a slight underestimate.